Bless Our Hearts: Can I Go Back To Bed Now? It's not even 9:15 and the Dish guy has been here, supposedly fixed the problem, and gone. His boss will be here later to confirm that all of the trees we have are preventing us from getting the highest of the high definition abilities from our TV due to the trees blocking the satellites' imput. But the TV does appear to get a signal when we turn it on now. The problem may have been the HDMI cord having a short in it. Lot of activity for this early on a Sunday but I'm in a pretty good mood about it all. Here's a picture that Mr. 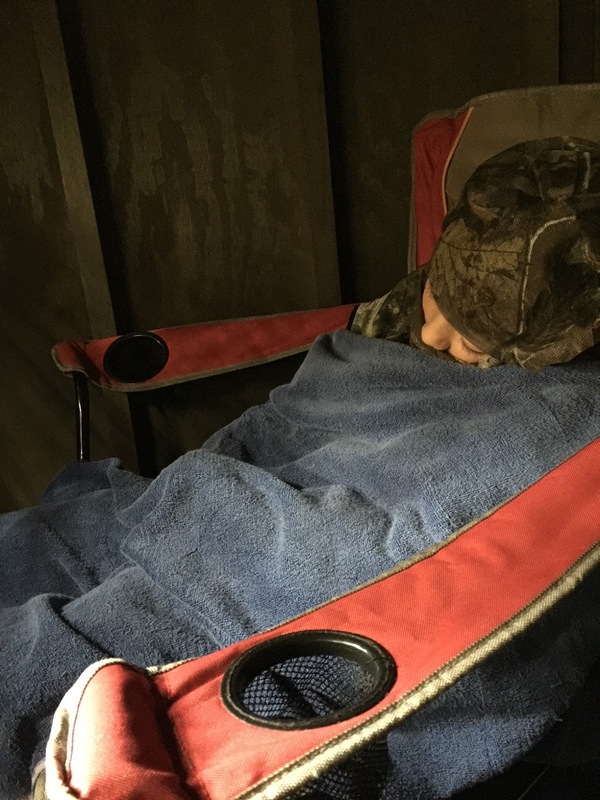 Moon sent of Owen napping in the deer blind. No buck to be seen this morning. And here's a picture of Levon that Jessie sent me. I haven't seen him in days and it's killing me. However, Vergil has to go out of town on business tomorrow and I believe that Jessie and the boys are going to come and spend a few nights with us. I have promised to spoil August and Jessie which leaves Jessie to spoil Levon and that is going to be fun. We can watch ALL the TV! I have promised that I will not make her watch Rolling Stone videos on the giant Youtube. I try to be thoughtful. I really do. Anyway, that's it from Lloyd at the moment. Maurice did just attack me fiercely which pissed me off because I shared my yogurt with her not twenty minutes ago. That cat has problems. I believe she slashed me all the way to the wrist bone. Maybe she just loves the taste of my flesh. Let's all have a good Sunday, okay? Oh, yikes! Did she really go all the way to the bone? That's pretty serious! Well, probably not to the bone but pretty deep. I'll survive. If the tree or trees blocking Mr. Moon's signal are either Bradford pear, pecan or cherry laurel, he probably will take them out. As you know, we do have a mighty lot of trees. But I've already told him NO LIVE OAKS but I don't think he'd do that anyway. The real deal is that he's been dying to rent a bucket truck and cut some trees down that need cutting down anyway. Mostly I think he just wants a bucket truck to play with. Oooo Levon is so adorable in that awesome tiny-man sweater! 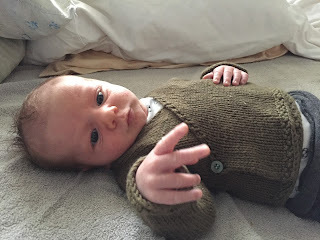 His other (far more talented) grandmother knitted that sweater for August. Isn't it beautiful? Oy Maurice. That's a rather dysfunctional relationship if you don't mind my saying so. Please take care of that wound, of course i know you will. And doesn't "Jessie and the boys" have a lovely ring to it? Levon does look like a science teacher named George in that little vest.